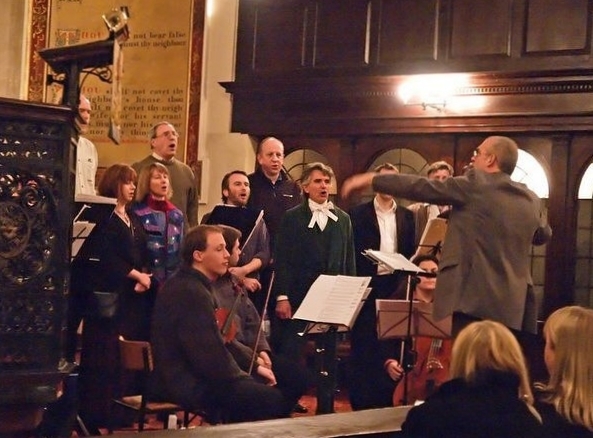 THE GLADLY SOLEMN SOUND (the name is taken from hymn words by Charles Wesley) was formed in 1992 following an encounter with The West Gallery Music Association at their annual weekend meeting in Ironbridge. 13 singers and players formed the first choir, of whom 3 are still members. Many changes have taken place since those early days. Our numbers have ebbed and flowed, reaching over 40 at one point, but have eventually settled down to about two dozen. We are now essentially an unaccompanied choir, but we occasionally return to the ‘choir and band’ setup which, for many, typifies West Gallery Music: for example we hire a string trio for our Lancaster Christmas Concert, and sometimes, to convey the feeling of the old style of musicking, conjure forth a band from amongst the singers – usually oboe, flute, tenor horn and cello. Our music remains mostly drawn from that of the English Parish Choirs of about 200 years ago. We do include related material though; American ‘Sacred Harp’ songs, glees and folksong arrangements all make appearances in our concerts, as do one or two recently-written pieces stylistically compatible with our core repertoire. We learn music in a number of ways: some read, some don’t, and many make good use of computer technology. But of course a certain amount of ‘note-bashing’ is inevitable. We have sung at Arts Festivals, at Folk Clubs and Fairs; in caves, cathedrals, on street corners and on Lakeland steamers. However we are most often heard at concerts in the small country churches where our music was originally performed. We do not ordinarily sing at church services; but we have sung at several weddings, including one Church of England and one open-air Pagan wedding.